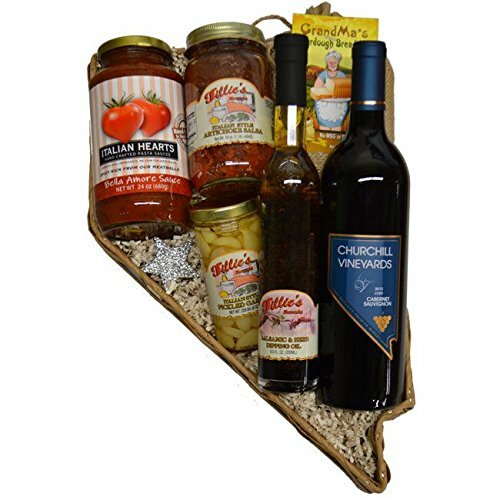 This 16" basket Includes Italian Hearts Pasta Sauce, Grandma's Sourdough Bread Mix, Tillie's Italian Salsa ,A Nevada Red Wine, Tillie's Pickled Garlic and Tillie's Oils for dipping or cooking. Send Your Family A Little Taste Of Nevada! Manufacturer: Flag Store of Nevada Inc. Brand: Flag Store of Nevada Inc. Publisher: Flag Store of Nevada Inc. Studio: Flag Store of Nevada Inc. If you have any questions about this product by Flag Store of Nevada Inc., contact us by completing and submitting the form below. If you are looking for a specif part number, please include it with your message.